Did you ever want to make something; but, you weren’t sure if you had the time, or the skill, or the whatever to get it done? That’s how I felt about attempting to make a primitive doll. Particularly since I’m not a doll person. 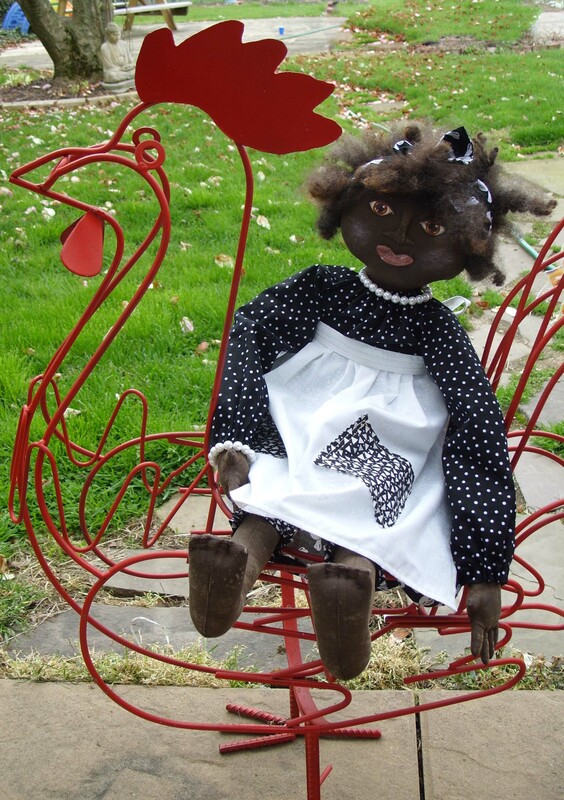 Well…okay…I love magickal dolls, but I don’t have tons of them prancing around my house. I vacillated for several weeks. I’m a git-er-done person when it comes to crafting projects. I do great with short ones and those that last a day or two…but, longer than that? My internal gas tank wears out. So…I debated big time on Emerald. No, there’s nothing green on her at all. She told me who she was. 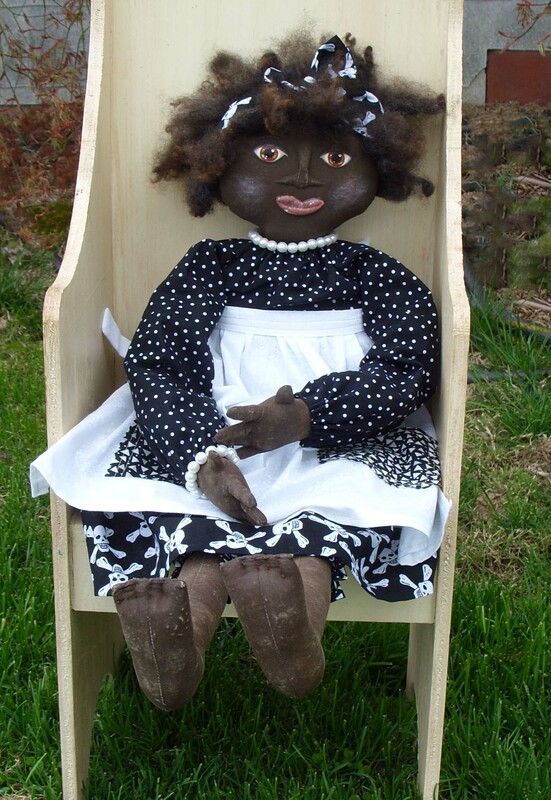 Anyway, it took me a while to build up the courage to attempt constructing such a doll. I would get ready to start, and then back off. Get ready again, and then fill my time with something else. 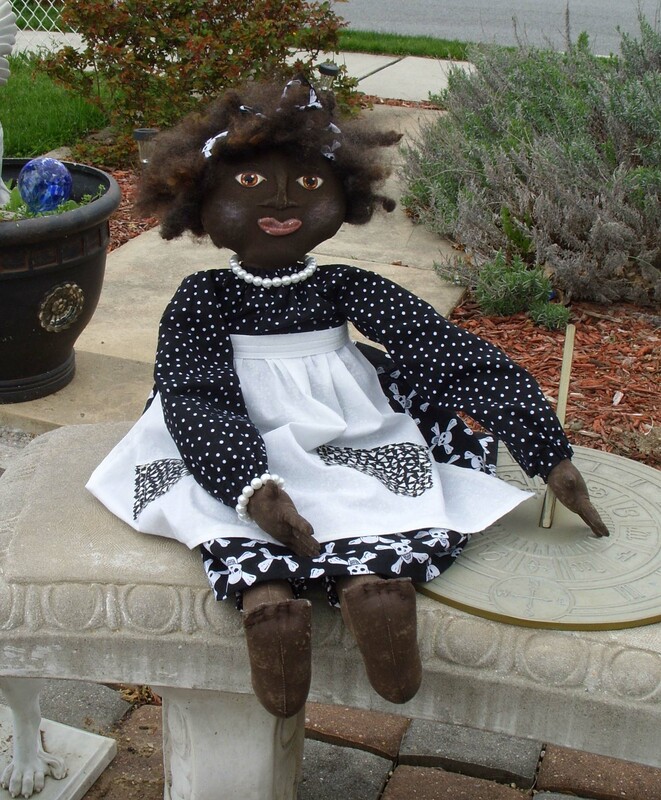 And yet…like I said before…I love magickal dolls. Voodoo dolls particularly. I don’t know why. I just love them. I think they are cool. Unique. Different. Powerful. Finally, I drug out my sewing machine and decided I would at least try. That’s what life is all about…trying…right? Problem was, I hadn’t used my sewing machine in a long time. After two stitches I realized the machine wasn’t in the cooperative mood. With a sigh, a major eye roll, and a few words I will not repeat here (PR and all) I motored to the Pike to get the blasted machine repaired… in the driving rain, no less. With the new moon high in the sky, I cut out the pattern pieces for Emerald. She took me sixty people-hours to complete. I sewed and stuffed her hands first and laid them on the table. When my daughter came for dinner, she looked at the disembodied little hands and said, “You know, Mom, that is really creepy.” So, I marched the hands across the table at her. She screamed. With everything in life, from caring for the dementia patient to making Emerald, I always try to incorporate the spiritual, the magickal, the glittering mindlight that we all are so capable of producing; but, so often forget the power we have. To me, nothing is worth doing unless I can somehow, some way, make it magickal. Which is why I empowered those little, stuffed disembodied hands, holding them in mine, willing light into them. Yet, the really creepy thing? Back in the 1930’s? The woman that owned the house I live in? 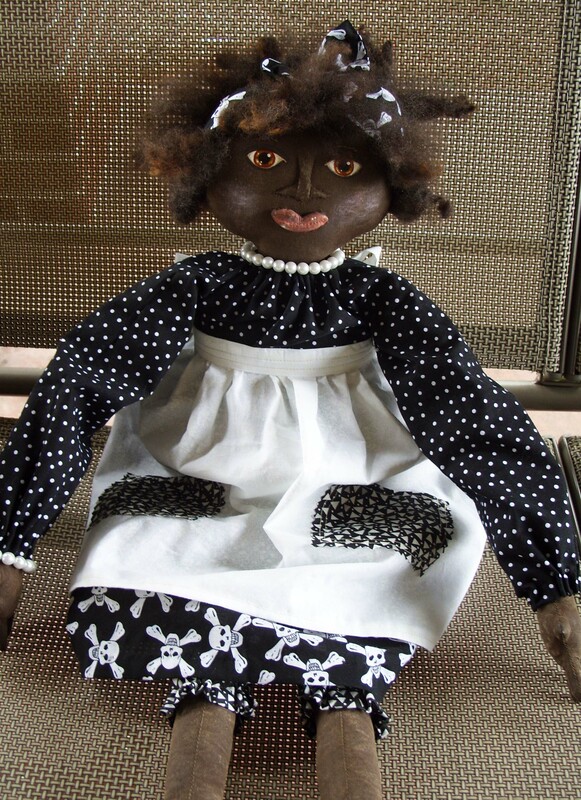 She was a doll maker. Yup. 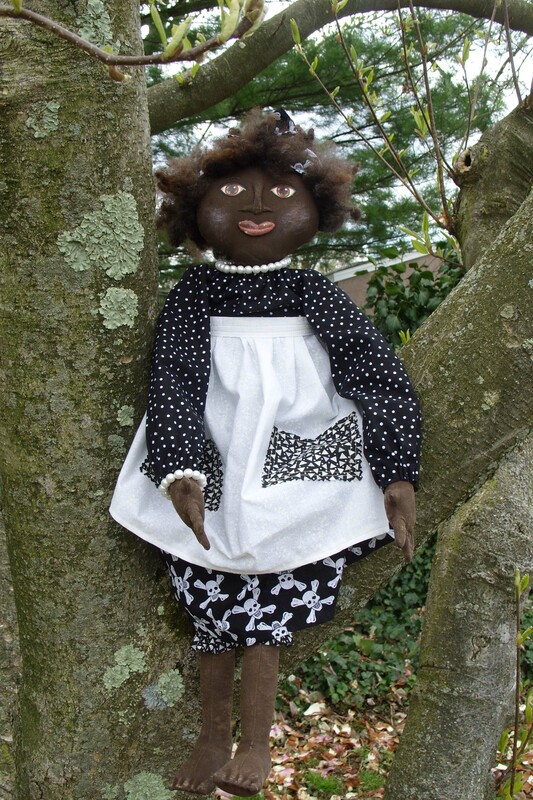 She even bought the water works property next to ours and converted the little building into “the doll house”, where she busied herself making and repairing primitive dolls and their clothes. We tore the building down a few years ago and converted that area into the prayer garden. Herbs from that prayer garden were added to Emerald as I stuffed her body cavity. If I made another doll like Emerald, there are things I would change. Like sewing her appendages on BEFORE painting and grunging her. Oh my stars and garters, it took me three hours to get those arms and legs on that doll. Trying to sew through painted muslin is not something I want to try again. I finally had to use a pair of jewelry pliers to pull the needle through. And, although I’d stuff the hands firmly like the directions call for, I think I’d put less stuffing in the arms so that they would be a little more flexible. While sewing the outline of the foot, I’d change the pattern so that the edges are rounded. That’s mechanical stuff. At one point, I thought Emerald was going to be hideous, and I almost stopped. I even eyed the trash bag. But, no, I said to myself. Keep going. Things have a way of turning out just the way they are supposed to. Emerald sat, in the buff, on the dining room table while I stitched together her clothes. I chose fabric with skulls and crossbones because…heck…I don’t know…I just thought it would be cool. She seemed to be impatient, so I sewed her bloomers first. After I dressed her in those she seemed to exude more serenity as I worked on her dress. I changed the pattern of the apron so that it could be removed and laundered, and added pockets for wishes that matched her bloomers. When completely dressed, Emerald told me her name. And she told me a VERY cool story. Which I’m still working on in my head. From the dining room table Emerald traveled to the altar, where I did a full ritual to empower her for protection of the home where ever she lives, love and of course…magick! Here are a few pics of Emerald on her first day completed in the world. Emerald learning to read a sundial. Emerald taking her first mechanical chicken ride. Emerald waiting patiently for afternoon tea. Emerald climbing her first tree. I guess the moral of this story is this: Even though you are hesitant to try something, hitch up your bloomers and go for it. You just never know what good things might happen.